In new media circles, one of the hottest topics of recent years has been the print-to-digital shift. People pundit about it, shout “print is dead” and wallow in the sadness sparked by nostalgia for a day when this wasn’t a question. We’ve also begun speculating on whether a device like the Kindle will really ever take our attention away from ink-on-paper. I myself have never been too interested in this debate. Perhaps that’s why I’ve done virtually nothing to avoid the switch from print to digital, but rather let it sweep over me naturally. Some people have been fed up with the clutter caused by print media or the fact that the delivery of traditional news is too slow. Others cling to magazines and newspapers out of necessity or because of conviction and dedication to a particular publication. My print-to-digital conversion happened not out of principle but because of a series of mundane circumstances. I see that series of mundane circumstances now happening not just with the shift from print to Internet media, but with the shift from broadcast television to Internet television, and the shift from mainstream media to user-generated content. The first mainstream broadcast television to lose my attention was the nightly news. Years ago, it became obvious that I could get the news I was interested in from the Web – and the Web was more timely, took less of my time and freed me from about 10 minutes of commercial interruptions. Now, I find myself watching almost no broadcast television. While I’ve been rabidly catching up on Lost, I’ve been doing it via Hulu & ABC.com. There are a lot of usability annoyances with Hulu’s service, but nevertheless it does a good job of delivering HD television on demand. Last year, I bought season two of Lost on DVD. This year, I’m catching up on missed episodes on the Internet. Another series of mundane circumstances is moving my attention from mainstream media to user-generated content. I’ve been watching video podcasts for years, but recently I’m spending a lot more time with them. One reason is that the content has gotten better and more varied. 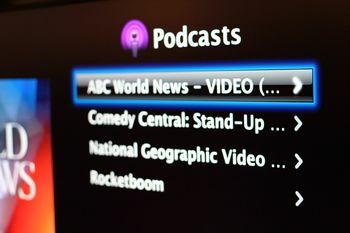 Even more important, though, is that more and more devices are embracing video podcasting. My phone is now a great platform for watching video podcasts. Our flatscreen TV is, to. If you followed the Consumer Electronics Show, you may have noticed that all sorts of gadgets are getting the ability to connect to the Internet, read news feeds and download Internet media. I’m not rushing out to buy an Internet refrigerator or a picture frame that plays video podcasts – but it’s obvious that devices like these will soon be parts of our lives. There’s a huge shift going on in media. Ten or fifteen years from now, we’ll have the perspective to see what a big shift it was and how much it changed our lives. We’ll be able to understand the unexpected ramifications of this shift. But for now, it’s often a series of mundane changes that are slowly weening our attention from mainstream broadcast television.